My birding gear isn’t good only for feathered creatures in flight under bright light. It can also capture metallic objects streaking in the dark night sky. I was setting up to get some shots of the supermoon over a week ago, but the clouds wouldn’t allow me good seeing. 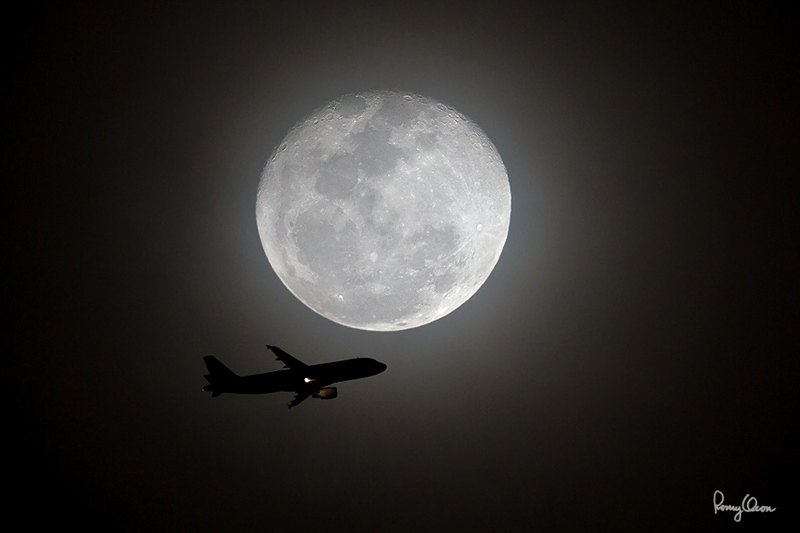 Rather than pack my rig without firing a shot, I waited for planes taking off a nearby airport to get near the moon. The clouds introduced a large glowing halo around the moon, and that served as “rim lighting” to reinforce the jet’s silhouette. Shooting info - Paranaque City, Philippines, March 21, 2011, Canon 1D MIV +EF 400 2.8 IS, f/2.8, 1/640 sec, ISO 1600, manual exposure, 475B/516 support. This is awesome!! :) Best of the super moon images iv come across! !